1. Brandon Hagel, Red Deer Rebels: The 20-year-old product of Morinville, Alta., went wild Friday night, scoring four times as the Red Deer Rebels knocked off the Edmonton Oil Kings by a 5-2 margin at Rogers Place. With the outburst, Hagel now leads the Rebels in scoring with 19 points (8G-11A) in 10 contests this season. The four-goal outing comes as the first four-goal game of Hagel’s career. 2. Stelio Mattheos, Brandon Wheat Kings: The prospect of the Carolina Hurricanes notched the second hat trick of his WHL career, helping the Wheat Kings skate to a 5-2 home ice win over the Everett Silvertips on Friday. The product of Winnipeg continues to impress in 2018-19, leading the Wheat Kings with an astounding 11 goals and 18 points in only nine contests. 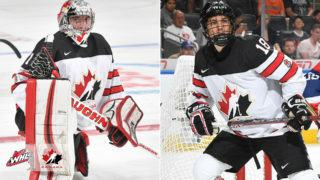 The 6-foot-1, 200-pound pivot was recently named to Team WHL’s roster for the 2018 CIBC Canada Russia Series and remains a strong candidate to challenge for a spot on Team Canada’s roster for the 2019 IIHF World Junior Championship. 3. Lassi Thomson, Kelowna Rockets: The Finnish import produced four points from the blueline, including two goals and two assists, as the Rockets roared past the Victoria Royals in an 8-2 triumph at Save-On-Foods Memorial Arena on Friday night. Thomson, a first-round selection at the 2018 CHL Import Draft, notched the game-winning goal midway through the second period. The native of Tampere, Finland, now has nine points (6G-3A) in his first 12 career WHL games. 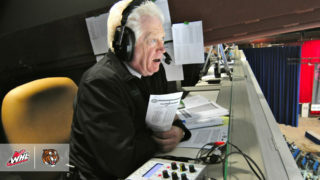 The Brandon Wheat Kings claimed a chippy win over the Everett Silvertips by a 5-2 margin on Friday. Lynden McCallum and Stelio Mattheos (Carolina Hurricanes) took care of the scoring for the Wheat Kings, with McCallum striking twice and Mattheos notching a hat trick. In the second period, Sahvan Khaira snapped one home with captain Connor Dewar (Minnesota Wild) scoring on the power play for the Silvertips. Jiri Patera held the Silvertips at bay for the third, stopping 36 of 38 shots to keep the 5-2 win for the Wheat Kings. Although the Moose Jaw Warriors were tough competitors for 60 minutes at home, they would ultimately fall 5-1 to the Calgary Hitmen. Jake Kryski opened the game with a beautiful breakaway, sparking the Hitmen offense. Cael Zimmerman roofed a goal in the second, while Mark Kastelic scored back-to-back goals in the third period for Calgary. Warriors defenceman Alek Sukunda ruined the Hitmen’s shutout chances with an up-close shot on Carl Stankowski to earn his first career WHL goal. While Sukanda’s effort was valiant, it wasn’t enough to get his team back in the game as Stankowski stopped 30 of 31 shots. 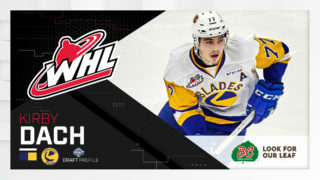 In a tight game that resulted in an overtime winner by 2019 NHL Draft prospect Kirby Dach, the Saskatoon Blades would win 3-2 over the Spokane Chiefs. 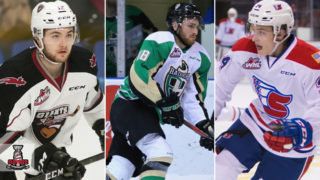 A quick tic-tac-toe goal on the power play by Eric Florchuk (Washington Capitals) opened the scoring for Saskatoon while 2019 NHL Draft prospect Luke Toporowski tied the game before the end of the first for Spokane. Spokane’s Ty Smith (New Jersey Devils) and Saskatoon’s Dach exchanged goals in the second period, leading to a scoreless third and eventually overtime where Dach scored his second of the night 37 seconds into the extra period to give the Blades the win. In Alberta’s capital city, the Red Deer Rebels earned a 5-2 win over the Edmonton Oil Kings. Just 30 seconds into the game, Rebels’ Alex Morozoff slid one home to take the lead, followed closely by Brandon Hagel’s first goal of the night to get Red Deer ahead 2-0. Rookie Jake Neighbours was quick to cut the deficit for Edmonton before the end of the first period. Hagel exchanged goals with Trey Fix-Wolansky (Columbus Blue Jackets) and scored another goal to secure his hat trick, improving the Rebels lead to 4-2. In third, Hagel scored his fourth and final goal while Ethan Anders managed to stop 41 of 43 shots during the game to collect the win. It’s not too often you see a penalty shot in overtime, but that’s exactly what James Hamblin enjoyed and he made the most of it by beating Reece Klassen to give the Medicine Hat Tigers a 4-3 victory over the Lethbridge Hurricanes on Friday. Florida Panthers prospect Linus Nassen registered a three-point night (1G-2A) from the blue line for Medicine Hat as the Tigers jumped ahead of the Hurricanes in the Central Division standings. Import goaltender Mads Sogaard made 26 saves for his third win of the campaign. Josh Pillar scored his first career WHL goal, set up by the first WHL assist for Logan Stankoven, as the Kamloops Blazers secured a 5-3 win over the Swift Current Broncos on Friday at the Sandman Centre. Pillar, the 14th overall selection from the 2017 WHL Bantam Draft, claimed his first career WHL goal in his 11th career WHL game. As for Stankoven, the fifth overall selection from the 2018 WHL Bantam Draft, enjoyed his WHL debut in his hometown by setting Pillar up on the game-winning goal with 3:12 to play in regulation. Kamloops product Max Patterson scored in his hometown, registering a power-play goal 6:38 into the third period to tie the game 3-3 on behalf of the Broncos. Jake Gricius scored twice on the power play as the Portland Winterhawks knocked off the Vancouver Giants by a 5-3 margin on Friday at the Moda Center. 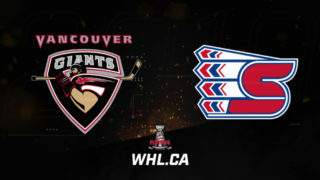 The Giants carried a 3-2 lead into the third period, only to watch it evaporate thanks to a three-goal outburst from the Winterhawks. Vegas Golden Knights prospect Cody Glass notched the game-tying tally before Reece Newkirk’s seventh of the season put Portland ahead 4-3. Ryan Hughes added an empty-net marker to seal the outcome. Danish import Joachim Blichfeld (24 points) collected two helpers to move within two points of Prince Albert Raiders forward Brett Leason (26 points) for the WHL scoring lead. Lassi Thomson and Liam Kindree collected four points each as the Kelowna Rockets exploded for an 8-2 win over the Victoria Royals at the Save-On-Foods Memorial Arena Friday night. 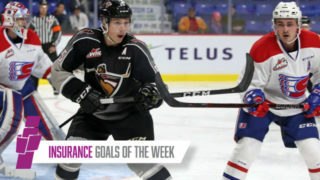 Thomson, selected in the first round (53rd) of the 2018 CHL Import Draft, enjoyed the first multi-goal game of his WHL career as he scored twice, adding two helpers. Kindree, an 18-year-old product of North Vancouver, tallied a goal and three assists to boost the Rockets. Kelowna led 4-2 after 40 minutes of playing, blowing open the contest with a four-goal effort in the third period. 2019 NHL Draft prospect Nolan Foote added a pair of markers for the Rockets. The Tri-City Americans scored four unanswered goals to skate past the Seattle Thunderbirds by a 4-2 tally Friday night in Kennewick. Jake Lee and Noah Philp scored back-to-back goals only 1:16 apart in the first period to give the visitors a good jump on the contest. But replies from Connor Bouchard and Anaheim Ducks prospect Kyle Olson knotted the affair through 20 minutes of play. A pair of late tallies from Parker AuCoin secured the win for the Ams. Tri-City improved to 4-4-0-0 on the season with the win.